Travega MD, Giles Harper, recently moderated the 35th anniversary conference for leading TMC Norad Travel Group. Held at the delightful Tylney Hall in Hampshire, guest speakers included, Eric Hallerberg, MD Sabre UK and Ireland, Paul Wait, CEO, Guild of Travel Management Companies, and leading motivational speaker Sunil Bali. 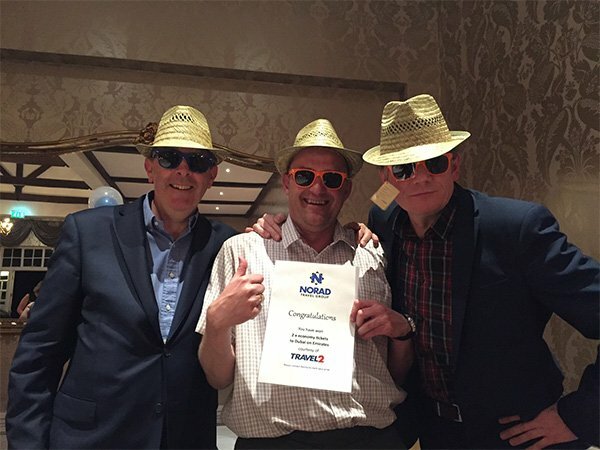 After a days hard work, Travel 2 hosted a great evening party; pictured are Giles Harper, Travega with the lucky winner of two tickets to Dubai donated by Andy Harris of Travel 2.